Will Maldives be able to repay its growing debt to China? Mohamed Nasheed, a former president now serving as advisor to new President Mohamed Ibrahim Solih, said that the Chinese ambassador to the Maldives, Zhang Lizhong, handed the government an invoice for $3.2 billion. One week after taking power, the new government of the Maldives says it has no idea how much it owes China, which has led a construction spree in the tiny Indian Ocean nation, but fears the debts run up in the past five years could be unsustainable. Mohamed Nasheed, a former president now serving as advisor to new President Mohamed Ibrahim Solih, said that the Chinese ambassador to the Maldives, Zhang Lizhong, handed the government an invoice for $3.2 billion - equivalent to around $8,000 for every inhabitant of the archipelago. China denies that, however, and says the number is closer to $1.5 billion. "It was an invoice. It just had a figure, $3.2 billion. It was shocking," said Nasheed. "It wasn't just a conversation, it was a written note handed over, it was clear, you owe us this much." Nasheed said Zhang gave Solih the note at a meeting on Oct. 6, days after his stunning election victory over former President Abdulla Yameen. He did not give further details of exactly how the note was worded. Asked about Nasheed's comments, China's Foreign Ministry said that its ambassador in the Maldives had rejected "this untruth" in statements to local media, referring to an interview with news website Avas in which Zhang was quoted as saying reports of debt of around $3 billion were "deeply exaggerated". China has underwritten millions of dollars in loans for infrastructure in the Maldives, located along its busy shipping route to the Middle East. But the unprecedented building boom in the island chain of around 400,000 people - known for its white sand beaches and luminous cyan water - stoked fears it was loading up on debt and prompted a strident opposition campaign that helped Solih defeat Yameen in an election in September. 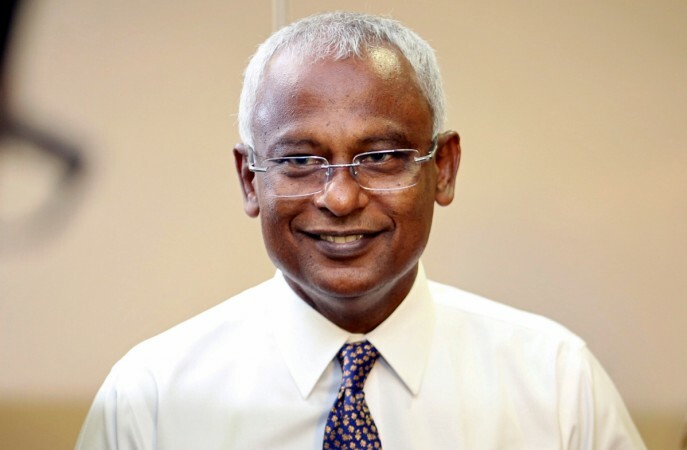 After taking office at the weekend, Solih's administration has said the country's finances are in worse shape than expected, and that it will take weeks or months to untangle details of all the deals struck with Chinese firms. "We are at a loss to understand how much we really owe to China," said Nasheed. "Direct debt, or direct bilateral government-to-government debt is one thing, but there is on top of that sovereign guarantees for the private sector. And there is also on top of that our state owned enterprises who have gone into debt." Yameen could not be reached for comment. But he said during the campaign that more work had occurred over the last few years than at any point in the past, and for that he had taken on debt. "Years of development have come during a short period of four or five years. But if we didn't take on debt as I said, and waited to do it with the income the Maldives earns this wouldn't have been possible," he said. In the Avas interview, Zhang said the Maldives' debt to China was $600 million to construct a sea bridge linking the capital Male with the airport, expand the airport, and build residential tower blocks on land reclaimed from the sea. Another $900 million had been earmarked as commercial loans to some state owned companies to fund projects from power to housing, the ambassador said, but much of that had not yet been issued. That was broadly supported by the governor of the Maldives central bank in testimony before the parliament's public finance committee on Wednesday, in which he estimated the country's liabilities to China at $1.5 billion. Maldives Monetary Authority' Governor Ahmed Naseer, who was appointed by the previous government, said he believed total of government-to-government debt from China amounted to $600 million. The remaining $900 million was an estimate of loans financed by Chinese banks with sovereign guarantees from the Maldives government, he said. Nasheed said the Chinese ambassador's public statements were at variance with what the Chinese side had conveyed to Solih. The ambassador had since requested a meeting with him, he said. Maldives' Foreign Minister Abdullah Shahid said on Thursday he planned to visit China soon to discuss bilateral issues. An official who was in Solih's transition team and who joined the government this week said he too had been told about the Chinese note submitted last month, and that the figure may have swelled because of sovereign guarantees that were given. "We are trying to unravel this. It looks like lots of IOUs were issued, pieces of paper. We are trying to find out, how many and to whom," the official said, requesting anonymity because of the sensitivity of the matter. With annual revenues of $1.5 billion and an annual gross domestic product of around $3.9 billion, it would be hard for the Maldives to service such a high debt, another incoming official, who is reviewing the liabilities of state-run enterprises, said. "We cannot go into default. We will face a default situation if we agree the debt to be what the sovereign guarantees are saying," the official said, asking not to be named because he was not authorised to speak to reporters. Signs of the infrastructure boom are everywhere in Male, from where tourists are whisked off in high speed boats to luxury resorts built on atolls. Yameen also leased Chinese developers an unspecified number of islands to build resorts for tourists, a fifth of whom are Chinese, in a dramatic expansion of ties since Beijing opened its embassy in the Maldives eight years ago. "We would like to reiterate, mutually beneficial cooperation between China and the Maldives takes place on the basis of equality and mutual benefit, and has already achieved results that are plain for all to see, and has been welcomed by the people of the Maldives," the Foreign Ministry said in a statement sent to Reuters. "We believe that under the leadership of the new Maldives government, China-Maldives friendly cooperation will continue to advance, and will keep making new achievements."